As someone who grew up in the Tzofim, a movement based the values of giving back to the community and volunteering, I am so excited to share this experience with the YJ AWB teens. Yesterday, I joined a group of teens volunteering at Sankofa, an urban farm where they grow organically grown produce and herbs, creates opportunities in the areas of urban revitalization, youth enrichment, education, health, and economic development. As an Israeli, it was such an intense learning experience for me to hear about Hurricane Katrina and the consequences this disaster has had and continues to have in the Lower Ninth Ward community, which is still struggling to rebuild eleven years after the devastation. 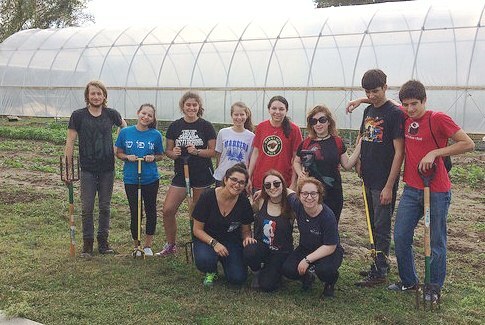 AWB teens spent much of the day working in a community vegetable garden that was created in order to provide fresh fruit and vegetables to neighborhood residents who otherwise would not have ready access to fresh produce. Upon finishing our work, we had the chance to drive around the neighborhood, up and down small side streets, and saw with our own eyes the many abandoned houses that have been boarded up since Katerina. From there, we headed to the First Pentecostal Church for our yearly Christmas party with local children. The teens planned games to play with them and it was wonderful to see them engaged with the children and feeling that they’re doing something meaningful. Throughout the day I was amazed at how the teens in our group were so engaged, wanting to help and interested to hear and learn as much as they could from this experience. As someone who beleives that Tikkun Olam is one of the most important values in Judaism, I see the AWB volunteer experience as extremely powerful. Our teens do not just talk about giving and helping they are actively doing it — making small miracles in other people’s lives. For me, the day definitely made me step back and to appreciate some of basic things that we all take for granted, like food and a home. I also began to notice similarities between the consequences of Katrina and the results of the fires that occurred in Israel recently. It’s not enough to just physically renew a house or neighborhood; it’s also necessary to help people rebuild emotionally. Meeting community residents, speaking with them and learning about what they’ve lost and rebuilt has been such a powerful experience. I am grateful to be a part of Alternative Winter Break 2016 and know that our participants will be changed by their time on the program; the little miracles they’ve help create here in NOLA this Hanukkah will stay with them forever, and perhaps cause them to think about things differently moving forward.